If you know where to get one message me ASAP! I’ll be your bff FOREVER! 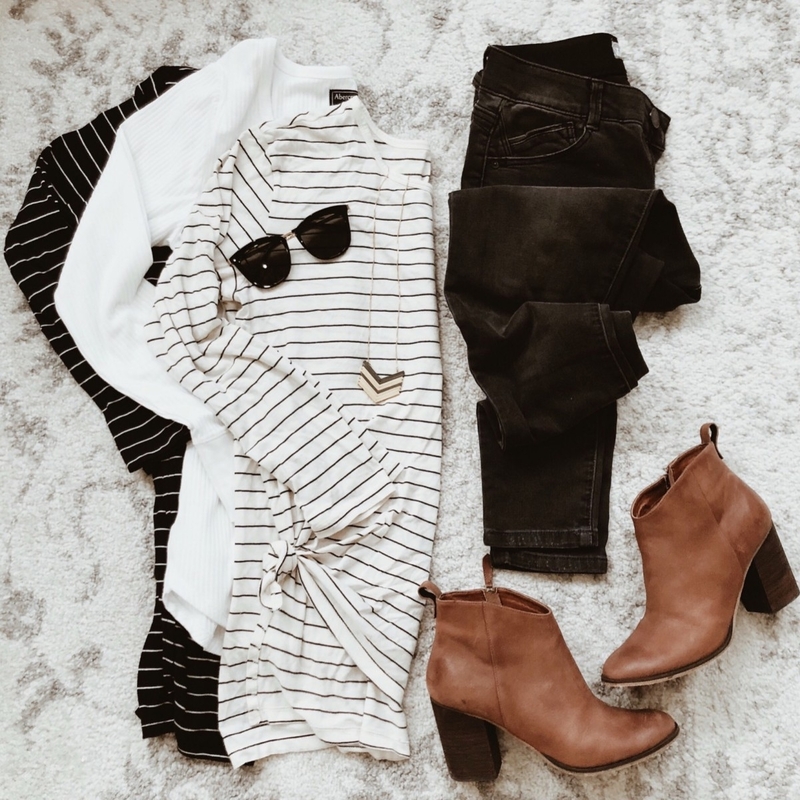 Let’s get the ball rolling with a top fall fashion seller TWO YEARS IN A ROW! With almost 2K reviews and coming in at under $20, this tee is a must have. I have it in white with black stripes and black with white stripes. The material on this holds up phenomenally when washed. It is also long enough to wear with leggings. I’m team #coverthebutt when it comes to wearing leggings. For size reference I wear a small in these. Amazon has really become one of my go to places for fall fashion shopping. There is a bit of searching that can take place but I liken it to taking a trip to Home Goods. You never know what you’ll find but there’s always something I walk away with. These shirts are no exception. They come in a two pack for $18. One is camo, the other striped. You can also get them in a v-neck version. They are a quality weight and have a bit of stretch to them. I ordered a size small and they are a bit fitted so I like them tucked in or paired with a vest. If you want them to be less fitted I suggest sizing up. I was sure this sweater was going to be a wooly ball of itchiness. LUCKILY it felt like a cloud of soft teddy bears. It comes in a soft pink color which I also love! 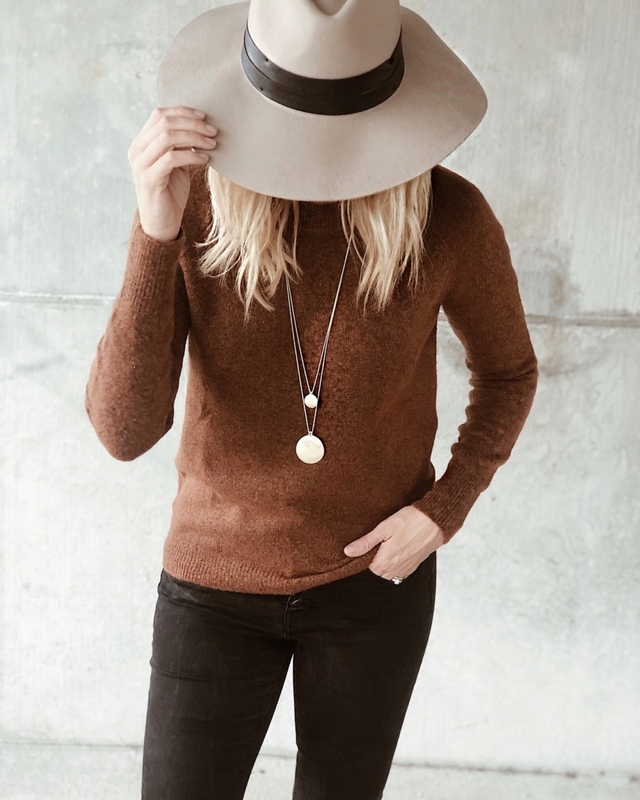 The back has a small open area up towards the neck and the rest of the neckline is connected by the collar or “bar.” This sweater is perfect for dressing up with a fun earring or dress it down with a mule. I am wearing a small. Funny story but these joggers are named after one of my friends! She’s super nice…just like these joggers! These are the cuddliest, softest, comfiest and any other adjective that ends in est. Were these babies on the couch with an old tee while you watch Netflix OR pair them with a your snaziest sneaks a long sleeve workout top and puffer vest for a pulled together sporty look. These run true to size. I’m wearing a small. Oh leopard how I love thee (insert giant heart). When this came out I knew I needed it ASAP. Pair it with jeans, skirts, pajamas. ANYTHING! It’s seriously the best. This is your favorite white basic button down shirt taken up 3 million notches because it is leopard. 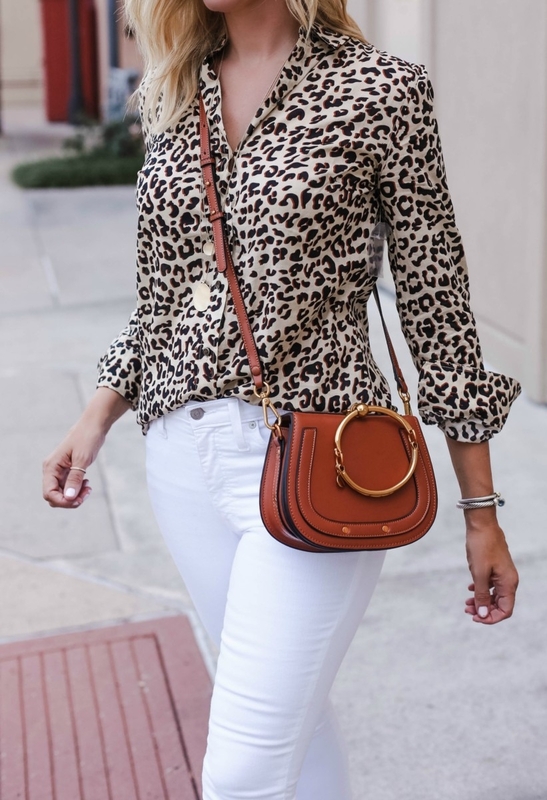 See the full post on this leopard top in this post. Wearing a small. This bracelet back has been very popular for two years. It is a dupe for an almost $2000 Chloe bag. It is very well made, comes in a million different colors, two day ship and free returns. My color is Dark Camel. *Sizing: The sizes are in cm. I use Google to find the inches. Below are a few quick conversions for you. I know dupes are a hot topic. Some totally disagree with them, others are like “save me all the money.” I fall somewhere in between. When it comes to small accessory items or really trendy items I will save money and get the dupe. If it is a classic bag and I want to treat myself or want a really good birthday/Christmas present (December birthday here) then I will splurge on a bag. I wore the black real deal Gucci belt to Nashville for our girls trip. My budget didn’t allow for two Gucci belts so I bought the dupe in brown. They look almost identical and if you want to save, get the dupe! I’ll say it a million times- I LOVE THIS DRESS. Black and white is always classic. This dress also has a classic silhouette so it won’t be out of style in three years. Dress it up or down like I did below. It runs true to size. Wearing a 4. 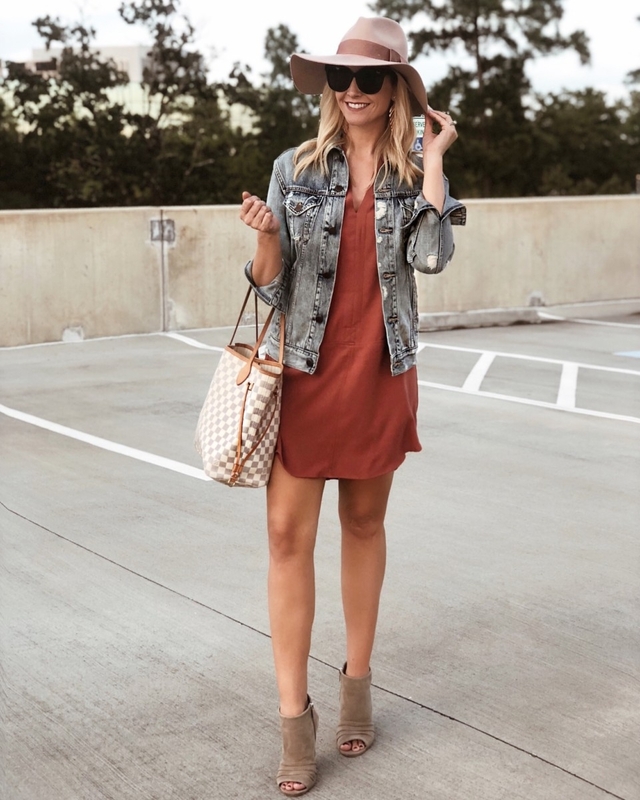 A basic dress is always a must in your fall fashion line-up. Throw this on with a denim jacket or vest. Layer it with a scarf or fun necklace. Wear it with tall boots, booties or mules. 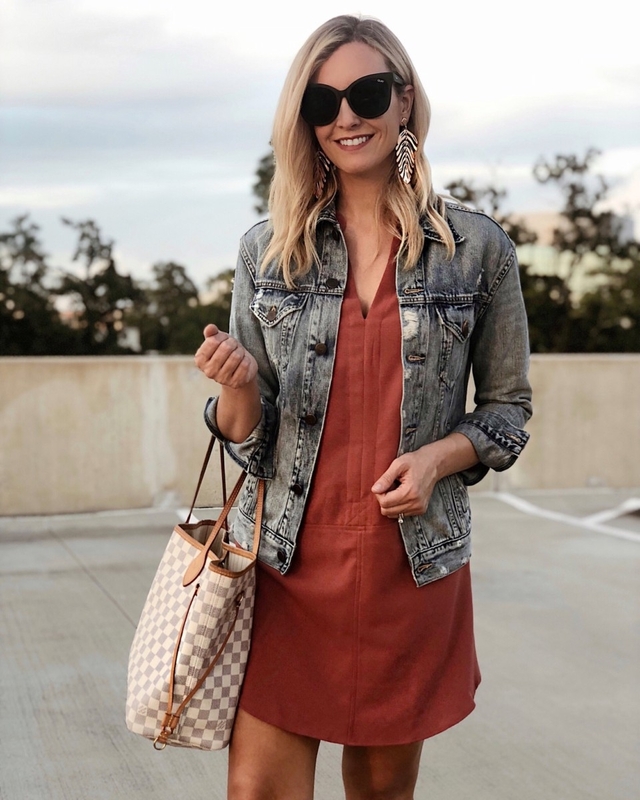 This is just an all around great basic dress. This dress is also long enough for us taller gals. I am 5’9 wearing a size small. It comes in 3 other colors. The hottest most universally flattering dress on the internet. I own this in black and brown spice heather. I wear this to every party and it is by far my most compliments piece of clothing. It is made of soft cotton which makes it crazy comfortable but it will play up the best parts of your figure. I size up in this dress. Wearing a medium.